These crisp, meaty nuts are a healthy, lower-cost alternative to almonds. Just three of them meet your daily requirement for the anti-cancer mineral Selenium! Grown in the Amazon, these organic brazil nuts are harvested by indigenous people in a program that protects precious rainforest from clear-cutting. Unlike most nuts you can find, these are shelled at low temperatures, protecting the trove of heart-healthy mono-unsaturated oils and the full spectrum of amino acids. 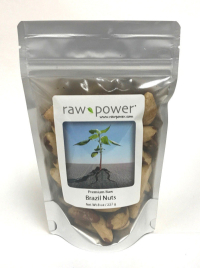 Note from Jolie: Brazil nuts are a perfect "pocket food," for kids and adults alike. At about 50 calories each nut, just a few can carry you over if you are between meals, away from home, or stuck somewhere without food.